A prophet is welcome in his own country! 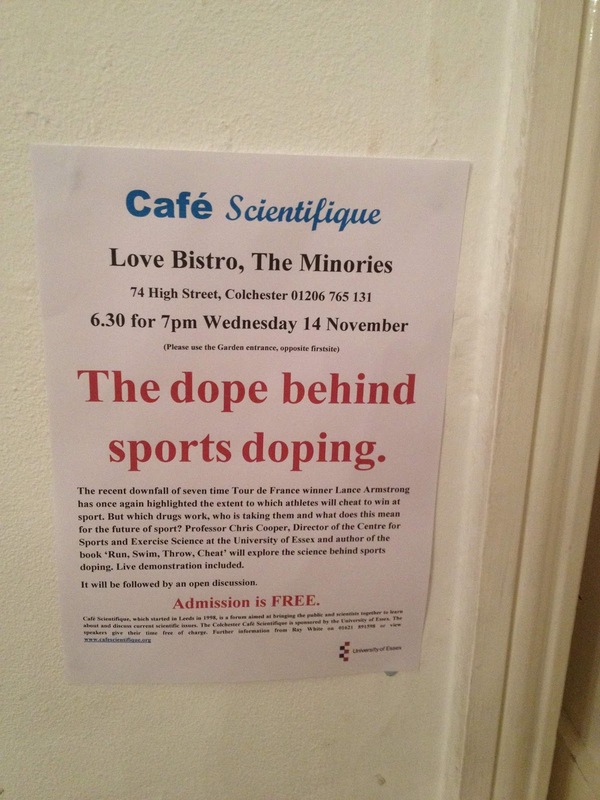 This is just a belated note to thank everyone who turned up at the Café Scientifique event in Colchester a couple of weeks ago. 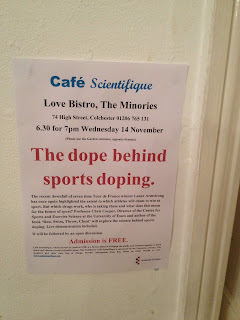 Café Scientifique run great popular science events and it was brilliant to give a talk in my current hometown after traipsing all over the country promoting the book. And what better place than the Love Bistro? As usual a great array of questions - though it is always a danger when they let the clinicians in as they think they know more than the rest of us (OK in many cases they actually do, but I like to keep an aura of my own scientific mystique). Anyway I advertised live performance enhancing drug taking though pseudoephedrine, caffeine and alcohol may not have been quite what the audience was expecting. Still my demonstration of blood doping using red wine seemed to go down well. Next time I’ll inject, but drinking is so much more fun….. So what about the science? Well taking all those drugs led me to think I really have got to see if they work. One of my undergraduate students is doing a meta-analysis on the performance benefits – or not – of pseudoephedrine, the stimulant that was banned, unbanned and then re-banned by WADA. The scientific reviews I cited in my book were not convinced of its efficacy; let’s see if the most recent data is more convincing. I’ll report back when I have the data.